We all know what “hunger” means. Do we all know what “personal preparedness” means? Personal preparedness means having what you need in an emergency. The emergency could be a hurricane or a major snow storm. Ideally, we do not want to be fighting for the last can of tuna fish or the last flashlight at the supermarket. We want to have this stuff at home AHEAD OF TIME. What’s missing in the picture above? Actually, two very important things are missing. One is a manual can opener. The other is water. 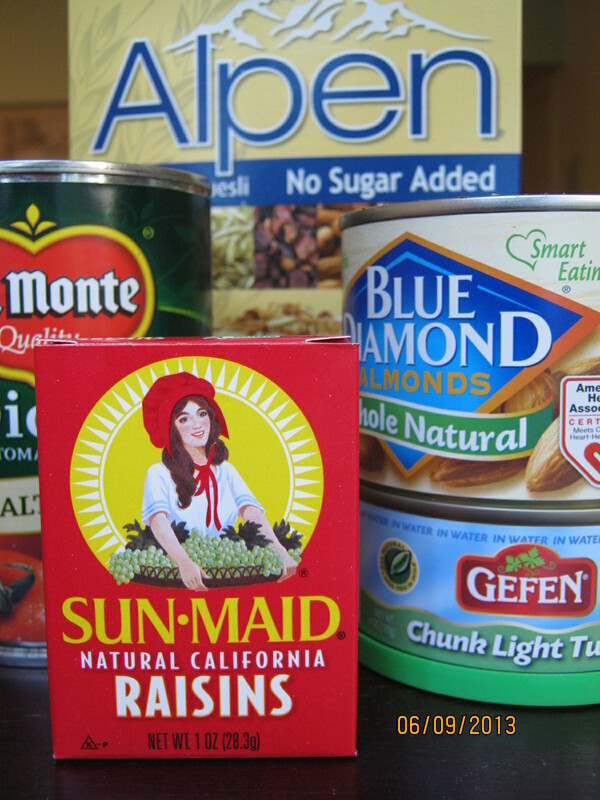 If there is no electricity during an emergency, we can still eat the cereal, the raisins, and the almonds. However, if there is no electricity, an electric can opener won’t work. The result? We will not be able to eat the can of tuna or the can of tomatoes. According to this article, “You MUST have 1 gallon of safe drinking water per person, per day, including pets. Without water a person will die in just a few days, children and pets sooner”. Words are good. Ideas are grand. However, to be ready for the next Sandy, we need to DO something NOW. Unfortunately, many things get in the way of doing what we know we should. One of these things is ANXIETY–not just ordinary anxiety, but PRIMITIVE ANXIETY. It’s an approach-avoidance situation. Taking steps toward preparedness can–in the short run–increase anxiety. To reduce anxiety, we put off doing (and even thinking about) what we know we should do. Anxiety makes it hard to move ahead. However, if we find a way to outsmart our anxiety, being better prepared–in the long run–reduces anxiety. What have you done to prepare in the event of another disaster? Does anxiety get in the way of doing what you know you should? If so, what would help you over the hump? There is a Comments section below. I hope to hear from you.